AECinfo.com News: Siding, Trim and Railing: 2019 Is All About Color! As the industry’s color leader, we’re always listening to our customers’ feedback and evaluating what colors to add and to which products. In 2019, we’re excited to extend 16 colors to a variety of products in the CertainTeed lineup. North Kingstown, RI, home featuring Monogram siding in rich Melrose. We’ve been blown away by the positive response to Cedar Impressions® Individual 5″ Sawmill Shingles‘ authentic cedar shingle appearance. After receiving a multitude of requests for solid colors to mimic the look of painted/dipped shingles, we’re proud to announce the launch of five solid colors to the Individual 5″ Sawmill Shingle panels and mitered corners: Colonial White, Natural Clay, Savannah Wicker, Seagrass and Sterling Gray. We’ll also be launching two new additional colors to the Monogram® line for the standard Double 4″ (D4) Clapboard, Double 5″ Clapboard and Double 5″ Dutchlap profiles, as well as to the extended length panels (16′, 20′ and 25′) in the D4 profile and to the Board & Batten Single 7″ family. These two new bold colors – Melrose, a saturated red apple color, and Brownstone, a bold, creamy chocolate color with hints of red – join the four colors added in 2018 (Espresso, Slate, Midnight Blue and Castle Stone). 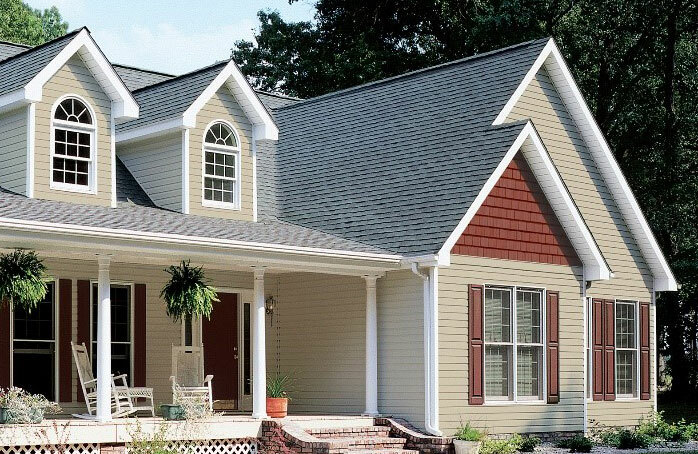 These new colors will also be introduced in a full line of complementary accessories that include: J-Channel, Undersill Trim, Outside Corner, Inside Corner, Bay Window Corner, T4 Universal Soffit and Trim Coil. We have introduced a new solid color accessory for the Cedar Impressions Single 7″ Straight Edge Perfection Shingles that will very closely match the color Cedar Blend. The color will be available in the full line of Cedar Blend Solid accessories, which includes Outside Corner, Inside Corner, J-Channel, Undersill Trim, Cornice Mold and Bay Window Corner. The Northwoods® Single 7″ Straight Edge Perfection profile will also receive three new colors in response to requests for lighter shades. The new colors include Colonial White, Sandstone Beige and Desert Tan. We are pleased to expand more of our popular deluxe and dark colors to the MainStreet™ market family for 2019. Castle Stone, Sable Brown and Pacific Blue will be added to the Double 4″ Woodgrain Clapboard and Dutchlap and the Double 5″ Woodgrain Clapboard and Dutchlap profiles. The Castle Stone color will also be extended to the Carolina Beaded™ market family for 2019. Lastly, we’re also expanding the Bermuda Blue color offering to the Beaded Triple 2″ Vinyl Carpentry soffit panel in both the solid and vented soffit profiles. The Sandstone Beige color will be added to the Value Triple 4″ soffit profile for both the solid and full vent profiles. But color isn’t the only thing we’re focusing on in 2019. We also have some exciting news to share about the EverNew® vinyl railing system. Market feedback has led us to develop a new baluster/infill option for the Kingston and Oxford Vinyl Railing Systems. The 3/4″ round aluminum balusters in a matte black, powder-coated finish will be available for all six EverNew Vinyl rail colors in 3′ and 3.5′ tall, and flat or stair applications in either 6′ or 8′ lengths. With these new colors and accents, customers are sure to find just the right mix and match of high-quality products to suit their style and create their own, personalized curb appeal.